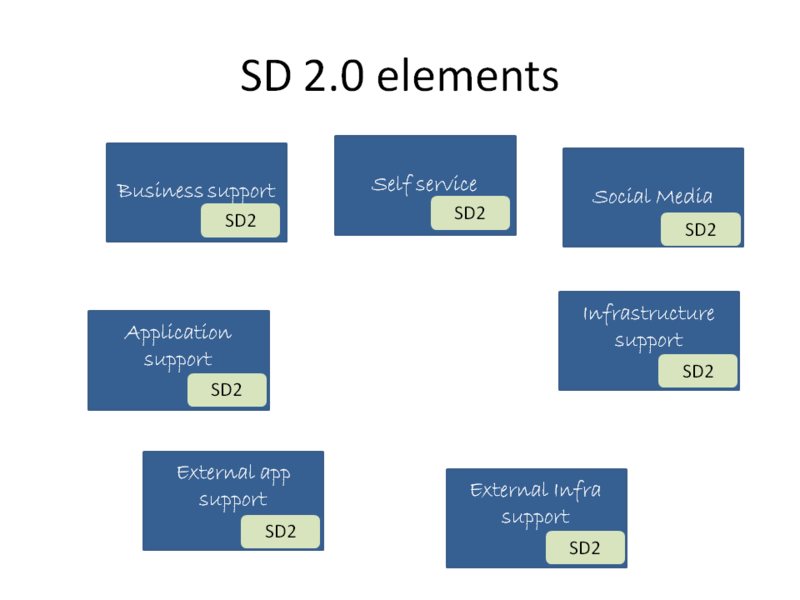 Service Desk 2.0 by Aale Roos is licensed under aCreative Commons Attribution-ShareAlike 3.0 Unported License. Information systems and computers can be difficult to use and when problems appear, they are hard to solve. Customers need support and this article is about how that support can be provided. Unfortunately, there are no magic tricks. The need for support arises from many sources. People are not good at reading instructions. It is quite hard to create easily understandable instructions. Any single problem may prevent the use of systems or deteriorate the user experience. On the other hand, good support can help the customer to move past the problem and make the customer relationship stronger. Support as an industry is a fairly new concept. Complex technology, like elevators, had their own operators trained for the task. That was also the case with early computers. For a while, computer departments were considered to be something very special. Users were not allowed near the machines, which were kept behind locked doors, and only trained operators were allowed to handle the machines. The PC gave normal workers even better access to the power of computing and allowed them to do things that were once only possible for the privileged operators. The computer users needed support. Computer professionals’ telephones were ringing and users were asking all kinds of questions. Often the first person who answered the phone could not answer the question and the user was instructed to try someone else; and the game of telephone-tag continued. Sometimes in an endless circle where no one accepted responsibility of the problem. 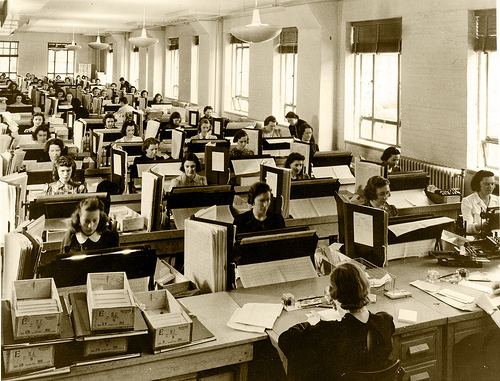 The solution to the support problem was the help desk—a team which would answer the phones. The concept became popular in the 1980’s. Ron Muns in the USA and Howard Kendall in the UK set up HDI (Help Desk Institute) and HUG (Helpdesk User Group) groups to support the people who were running these service. The help desk model was a great success; it was a major improvement to the previous situation, both for IT and the users of IT services. A new IT support industry was born. Rapid development in IT has changed the IT support world. The role of the IT department is changing from a service provider to a service integrator and in many cases the change is not easy. People manage their own networks and systems at home and many think they are doing it better that their IT department at work. The services are much more complex but also more accessible.The situation today is completely different from the early days of PCs. The technology was unstable and difficult to use. The majority of users were new to the technology and their questions were easy. Today, users are experienced and systems are far more complex, but also more stable, and there are often many players involved. A good analogy for the change can be found from the roads. The service station used to mean a place where you could get help with technical problems with your car. There was a garage and some mechanics who could do maintenance and repairs. Today, in many countries, the service stations sell food. Cars have become more reliable, but also more complex. There is no need for the roadside garage service. Exactly the same process is going on with computers. Apple is showing the way with easy-to-use and effortless computing. The modern support operation is in a hard place between more demanding customers and increasing complexity. This document is based on a long experience with Help Desks, starting from 1987, and observations of current and emerging best practices. I have interviewed people who are providing support in an innovative way. The word service seems to have several different meanings. One meaning is the act of service where two persons interact in a service event. Another set of services are the non-contact or non visible services like cleaning, security or repair. You come to a clean office where the flickering light has been fixed and nobody has stolen your computer. There is no contact and a person may notice the service only when it is missing—we pay no attention to a clean table, but we notice the messy table. Data communication, electricity, water and plumbing are also services. Again these can be simple or complex. This looks like the definition of outsourcing or renting. It does not cover services where somebody works with the customer’s equipment. This would be a better definition: Means of delivering value to the customer by facilitating the outcomes the customer wants to achieve. Service is simple when customers, themselves, understand it well and could fairly easily provide it. requires special capabilities from the provider. Complex services often have to be bought because you do not have the capability to do them. Complex services can be immature. “Always in beta” is a concept where new services are published and replaced before they become mature. In the modern world a mature service is close to being an obsolete service. We wanted to bring the WordPress experience to a larger audience. So we created WordPress.com, a hosted version of the open source package where you can start a blog in seconds without any technical knowledge. We’re a bit of an underdog, as there are much larger hosted blogging services such as Blogger that have been out for years, but when WordPress.org got started, people said the blog software market was saturated and there wasn’t room for anything new. (The big players then were Greymatter and Movable Type.) We think we have something unique to bring to the table. Automattic Inc. is the company behind WordPress. It is a startup from a handful of people passionate about making the web a better place. We are strong believers in Open Source and the vast majority of our work is available under licenses like the GPL. We work from places all around the world. Automattic first got started around August of 2005. I have been their customer for nearly five years and WordPress is probably the most important complex IT service I use. I have set up three active websites. WordPress has 20 million customers and 108 staff. Flowdock is a shared team inbox with group chat. Teams using Flowdock stay up-to-date, react in seconds instead of hours, and never forget anything. Flowdock brings activity from your project management tools (Pivotal Tracker, JIRA), version control systems (GitHub, BitBucket, Kiln), customer feedback channels (Zendesk, email lists) and many other sources to an easily consumable stream. Teams can then work on the issues together, and react in seconds. When there’s something worth remembering, #tag it in Flowdock! You’ll easily find those memos, code snippets and contacts when they’re tagged. It can be even used to build lists of #bugs, #todos, #competitors or whatever you’d like. I have used FlowDock for one team effort and found it useful but realized that it needs an active team that works together continuously. It is less useful for a loose team. ServiceNow is a leading provider of cloud-based services that automate enterprise IT operations. ServiceNow redefined the service desk with intuitive usability and the introduction of social IT. Features like Chat and Live help make your staff more productive and collaborative while your support costs shrink. Combining social IT and self-help offers your employees a simple and familiar way to request goods and services from IT. You can empower your user population to answer common support questions and to access knowledge articles for immediate answers. And if they need something from IT, they can open a quick chat session or make a request in the same way they make online purchases. Enfo is a Nordic IT service company which provides companies and organisations with easy-to-use IT services. In its services, Enfo utilises its more than 45 years of experience in IT and the competence of its expert IT professionals.Approximately 750 top experts ensure that Enfo’s customers get the best out of their IT. Enfo’s turnover is about EUR 150 million. These cases are quite different. Flowdock, ServiceNow and WordPress.com are all software as service (SAAS). Flowdock and WordPress.com use continuous deployment while ServiceNow has more traditional versions. Enfo is a full range IT service provider with a limited number of customers. they do not apply ITIL and one can see that a lot of ITIL practices would be quite impossible. Think of doing 16 releases per day through the 9? processes ITIL defines. they do not use formal or documented processes, but are very efficient. This interview was done in April, 2012 with Andrew Spittle who is team leader for Happiness Engineers. Automattic Inc. has 108 employees throughout 24 countries and 26 US States. The overall Happiness team is around 20 people at Automattic. That includes various support-related teams, though (Terms of Service, for example). The Core Happiness team, which handles all email and forum support, is 10 people. Their support employees are called Happiness Engineers. The titles are in line with other titles in the company. Here are some other examples: Iñtërnâtiônàlizætiønër, Code Wrangler, Bug Zapper etc. The CEO’s title is Band Manager. Their main service, WordPress, has 20+ million customers. They have two channels of support. There are forums, where customers can search answers, ask questions and start new threads. The other channel is a simple form. As you can see, the customer information is already there, so the customer need only to fill in the question or problem. The team receives 24,000 forms per month and another 24,000 new threads are started on the forums. The 50,000 incoming requests are a heavy load for just 10 people who are geographically spread out from the west coast of the US to Israel. How does this kind of support work, do they have advanced tools? No. We support them primarily through email and forums. We have internal tools for looking up the necessary information for support. Much of what we do isn’t fancy, it just works. With so many people using WordPress, well-tested tools like email, are sometimes the best option. The company runs things by using blogs. They have a hundred private task-oriented blogs to avoid e-mail. One of the blogs is for change requests. As a customer I can assure that their support works very well, it is fast and good. As a paying customer who has paid the staggering total of $175 for the four and half years of service, I have been overwhelmed by the quality of support. I have even been able to make a successful change request to the product. The team makes a lot of changes; the current version being its 40,000th, and there are about 16 releases per day. Nope. We actually work in a very open and relaxed manner. We tend to avoid any rigid framework or methodology and instead go with what works best for everyone on the team. The team is spread out from Israel to the western US and everywhere in between. With such a diverse team, keeping things flexible is the best way we’ve found for growing as a team and with our product. We don’t have hierarchy, no escalations. A lot of trust individual people. We don’t adhere to a process because it is a process. This interview was done in April, 2012 with Mikael Roos who is a Founder of the company and in charge of product development. Flowdock is a small startup with 8 people, located in Helsinki, Finland. It has just received its first capital injection and is growing rapidly but does not want to publicize volumes. 1) team@flowdock.com is our support e-mail address which we tell users to e-mail. 2) In-app feedback form. Within the Flowdock web app, there’s a button labeled feedback, which lets you send us any feedback you have on your mind. This feature has been pivotal in people telling us what problems they have with the UX. Whenever they encounter them, they can tell us right away, instead of when they’ve been mulling over the problems for a longer time. We get more useful feedback and feature requests because of it. 3) http://flowdock.uservoice.com is our feature request forum where users can suggest and vote on features. We let them know what we think and when they might expect the features to be built. Like WordPress, Flowdock also uses its own tool for managing requests. Our current feedback process is based on dogfooding, ie. we use Flowdock to handle the feedback. All feedback comes to our flow tagged with tags #feedback and #todo. Then we can have a quick chat about it, and decide who answers. Once the e-mail is answered (the reply also comes to the flow), the #todo tag is removed. This gives us a queue of unanswered e-mails that we follow. It’s a team effort and everyone in the company takes part. The product manager manages the backlog, which is a prioritized list of features. Max 4 features can be under development simultaneously. Once a feature completes and it’s deployed to production, a new feature is taken from the backlog, planned and taken under development. When development for a feature completes, it goes through peer review before it is merged to our master branch of the software. It is a requirement that the master branch should always be production-ready. Whenever a change is made to the master branch, a suite of unit and integration tests are run (continuous integration). We deploy to production several times a day. The deployment process involves a deploy to QA environment, where a battery of automated acceptance tests are run. When those pass, the build can be deployed to production. If a user finds a bug and reports it to us, we can fix it and get the change to production in a matter of minutes. Do you apply ITIL or some other framework? Why or why not? The approach combines elements of scrum, kanban and several agile software development practices. We can’t afford to have process for process’s sake. Every two weeks we have a retrospective meeting over beers, where we talk about what could have gone better during the last two weeks and come up with ways to do them better and track how we are succeeding in that. We are 8 people. Because we can fix bugs so effectively, there are no known bugs that prevent people from doing something, apart from some very nice-to-have things (eg. URL parsing edge cases). There are no open support requests (just cleared the queue) either. How many users/customers ServiceNow has? ServiceNow supports more than 1000 organizations globally and more than 600 employees internally. How do you support your customers? Email, self service, phone for traditional support lanes, social (activity stream and community-based support) for internal and customers seeking guidance outside of normal support boundaries. How many persons work in support? Our internal service desk has 2-3 employees and our external SD has 20 employees. In the SaaS model, our entire development and cloud infrastructure teams are focused on and involved in customer support. Including our professional services and formal customer support organizations, more than half of the company (total 600) supports our customers. How important is peer-to-peer support? Peer support is critical for our ability to scale and to rapidly and successfully onboard new customers and employees. Do you record all contacts, also social media contacts? Could you tell me the number of different types of contacts in Jan-Feb? We do not log social media contact as tickets. All contacts are recorded including social media. Approximate numbers for contacts are difficult to pin down for this interview as we have non-traditional support areas like our community and Live stream. I think that the ticketing system is used mostly for measure productivity but this will not work anymore in the world of social media support. Internally the ITIL framework is taught to all employees regardless of position and is supported through our tool and processes but we practice new approaches in a very agile manner. The internal adoption of ITIL is quite loose. For example our service catalog is not the real thing, sales uses different service offerings. We do not have any dedicated problem managers, you could say that we have outsourced our problem management to our user community. Our customers are technically very savy. We are not dependent on ITIL in the way the legacy support software providers are. The mindset is different, it is like comparing a Tesla (electronic car) dealer to a Ford dealer. How do you handle feedback from customers? Feedback comes in all the traditional forms as well as via our community site. Our community site, social media and peer networking also address the a large amount of feedback and engagement in our customers, prospects and partners. This interview was done in May 2012 with Director of Customer Service Minna Nousiainen. How many users/customers Enfo has? In Service Desk we have about 35 customers that have ca. 20 000 end users. How do you support them? Do you apply SPOC or do customers contact experts directly? We apply SPOC, so most of the contacts come to Service Desk. Enfo’s (server) Monitoring is another place to contact for server and network incidents. This is mainly used by customers’ ICT people. It depends a bit how this is counted. In Service Desk works about 30 people. In a way almost every person in Enfo’s service center supports our customers. How important it is that employees are happy and enjoy their work? Very, very important. It shows everywhere and especially to the customers. How do you handle the permanent solutions, do you have a separate team which makes changes to prevent incidents from repeating or is this also part of service desk work? Most changes are made by other teams like 2nd and 3rd line support. We don’t really have very effective way of preventing incidents to repeat. I don’t think I understand this question. Yes we do, but we don’t have social media as our contact channel (yet). We had 8626 calls and 6285 emails on January and 8053 calls and 5417 emails on February. Yes, we apply ITIL and ISO 20 000. Those frameworks are decided by our company, but still we implement only the parts that suits our business. We collect feedback many different ways. Of course we have ticket-based survey and it is sent to all our end-users that contact us. Then we have SMS-based survey for end-users using mobile phones. This is quite realtime and sends the SMS message after the phone call. These are based on our phone system. We have yearly surveys to our customers, both to end-users and the managers. Those are mainly handled by our customer relationship people. A key to understanding any phenomena, is to recognize its basic types or concepts. In support, the key concept is contacts. Customers contact service by various ways; these include phone calls, tickets, email, visits, accidental meetings, and social media. Customer problems are one cause of contact. If the customer cannot use the service, there is a customer problem. This is, of course, also a problem for the service provider. There are many examples of failed services or products that are too difficult to use. The support organization handles contacts. 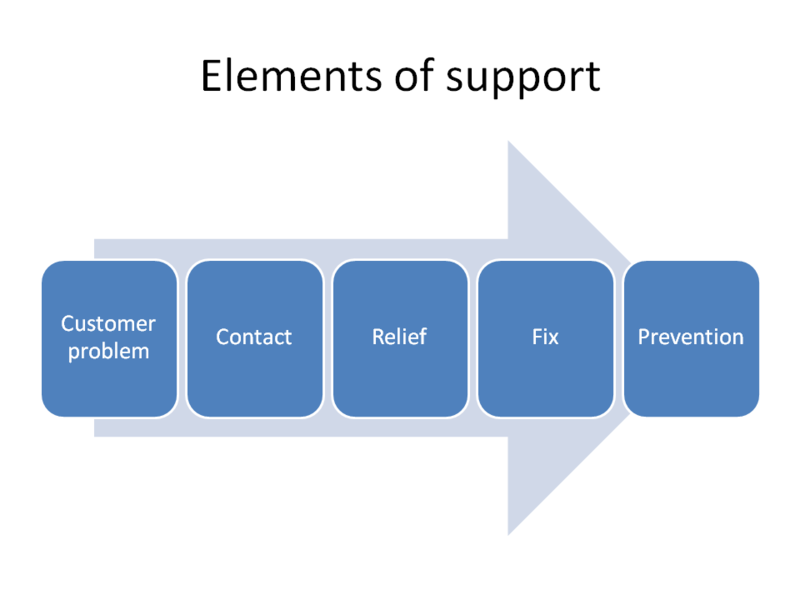 When customers have problems they may contact the support organization, but it is not a one-to-one relationship. The contacts make the customers’ problems visible to the support organization. Problems are also opportunities. Recognising opportunities is the major goal for the new support function. A problem can reveal an opportunity to improve customer’s operation. The improvement may involve new technology, new service but could be also a change in customer’s process. One example. The service desk manager noticed that one University faculty had more printing related problems than the rest of the University. The investigated the causes and found out that the methods this faculty used required students to print more than the other students. While they did make changes to the printing technology they also started a change in the teaching methods. Order means that the customer wants some service. This can be an application, device or a change to existing services. It can also mean some work to be done or a booking to some event. Feedback means an opinion or suggestion concerning the service. It can also be a request for compensation for some problem. Fault or failure is a situation where the system does not work and needs to be fixed. Sometimes faults cause customer problems, but not always. A fault can even be beneficial to the customer. For example, giving customer unplanned access to a service. A problem is a situation where there is a possibility of repeating customer failures or faults. The risk of a problem is a function of the probability and the cost of the failure. There are three stages to solving a customer problem. Relief means that the current customer’s immediate problem has been solved by a workaround or a some other one-time solution. Replacing a corrupted file with the latest backup is an example. Relief can mean end-of-case if there is no fault. Fix means that the fault has been repaired. Replacing any defective component like a failed disk is a fix. Prevention means making changes that will prevent a similar customer problem or fault from reoccurring. It might consist of several actions. Mirroring a system is one example. Let’s look at some scenarios to understand the meaning. A disk fails at 09:01. Monitoring notices this and creates a fault ticket at 09:07. The ticket is closed at 09:14 when the disk has been replaced and service is back to normal. A customer calls at 09:13 and reports that he cannot open a file, which he urgently needs. Service Desk opens a customer problem ticket at 09:14, sees that the file is unavailable because of a disk failure, and helps the customer to retrieve a backup copy of the file. The ticket is closed at 09:20. Then the Service Desk creates a fault ticket at 09:22. The fault ticket is closed at 09:32 when the disk has been replaced and service is back to normal. Between 09:15 and 09:30 there are 145 incoming contacts to Service Desk, of which 35 get an answer within SLA. 15 people complain about bad service. The Service Desk opens 35 customer problem tickets and 15 feedback tickets. The SD manager asks the Risk Manager to find out why the disk failure was not noticed in time and what could be done to prevent this event from reoccurring. A new version of a project management application has been released during the weekend. On the following Monday, Service Desk call volume grows to 220% of normal and 75% of calls are people asking how to use the new version. During the first two weeks, there are 1476 “how to” calls and 17 calls about three actual faults in the new version. 377 people complain the new version is hard to use. Service Desk reports 1493 customer problems, 377 feedbacks and 3 faults and the release is classified as a major failure as there were over 1000 customer problems. The Release Manager is furious because she insists that there were only three incidents and that the release should have been classified as successful, as there were fewer than five incidents. The SD manager asks the Risk Manager to study how this could be prevented in the future. A customer problem has three aspects: customer, fault and risk. Customer aspect concentrates on the customer and tries to remedy the situation by any possible means. This can mean fixing the underlying fault, if that is the swiftest way, but in many cases some workaround is a more suitable solution. Fault aspect concentrates on the fault and tries to fix it as soon as possible. This may mean that one must find what has caused the fault, but more important is to eliminate the visible consequences. Risk aspect considers the likelihood of the event happening again. To do that, one must understand the causes of the fault or customer problem. The goal of a support function is to ensure and enhance the capability of the service to provide value by helping customers to use it. This is very clear in the cases, none of them represent traditional internal support, for them users are customers. Support should have a good reputation among its customers, and customers should have confidence in Support’s ability to solve all their needs. Support is successful only if the service is successful, so support metrics should reflect the overall service metrics. All support activity metrics are mixed. Increasing volume may be a positive sign of the support unit’s popularity or of decreasing service quality. High first level resolution rate can mean better capability to solve customer’s problems or a lack of ability to solve issues that are causing problems for the customer. The number of incoming orders is usually a positive element, unless these orders are for elements that should have been delivered with the original order. We must remember that each customer problem is a failure of the service. It would be better to have no, or very little, customer problems. All repetitive, i.e. easy problems should be eliminated, leaving only difficult and hard to solve problems. first contact resolution rate is a measure of success. In this case the SD provider needs to have a lot of simple problems, which create revenue and are easy to solve. The Service Provider can ensure this by not removing the causes of repeating customer problems and by transferring all difficult problems to the customer’s own IT department. The Lean concept is a good model for considering the role and goal of support. The employees and customers use IT as a tool to create value. Any problem can stop the flow of value creation and the main goal of support is to keep the value flow running. Optimizing support can be harmful for the whole. 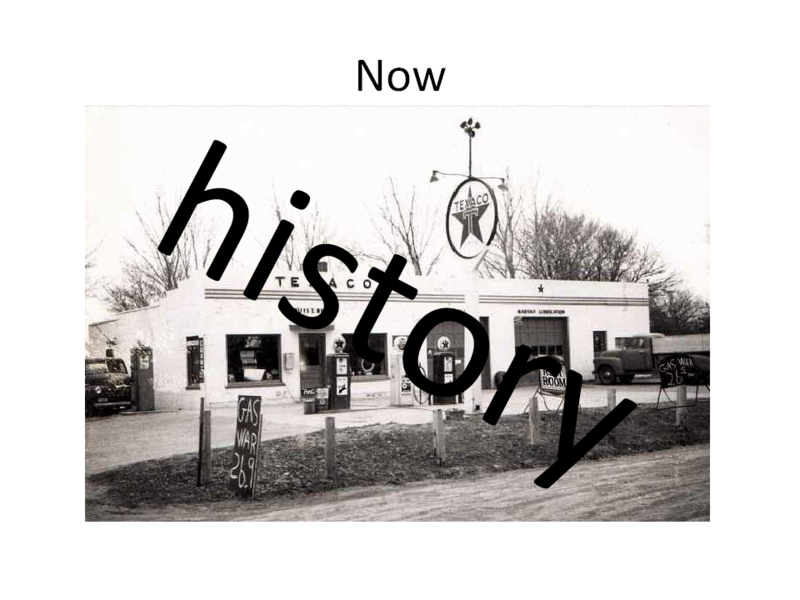 The Business decides to open a new service, which should increase revenue, increase loyalty among current customers, and bring in new customers. The new service uses a new IT system and there is no way to do full-scale production tests so some problems will be inevitable. Instead of looking at the support operation, the new Support Function is looking at the big picture. The traditional best practice has been to collect all support personnel in one open space, behind one telephone number and one e-mail address. A Single Point Of Contact (SPOC) has many benefits. It is easy to market, easy to contact and efficient. That is, if it works. A SPOC needs a fairly homogeneous customer group. The model is based on the 20-80 “rule”. In this case it means that 20% of problems generate 80% of contacts. Therefore, the SPOC staff need to be able to handle only 20% of the customer problems to solve 80% of contacts. Usually the support group is separate from the groups that actually maintain the service. The SPOC doesn’t have to be as simple as described above. It can be virtual; there can be subgroups within a SPOC; and different customer segments may have their own SPOCs. The theory is that all, or nearly all, support requests come to the SPOC. The problem with this approach is that it has become harder for one person to support all IT technology. The number of applications, devices and environments is growing rapidly. In the 1990s it was enough to know Windows, Office and a few other key applications. Today there might be iOS, Linux, Android, Blackberry… At the same time, users have become better at using their technology. The truth is that the SPOC is an illusion. People in many companies rely more on peer-to-peer support than the official support channel. The alternative to SPOC is an MPOC—Multiple Points of Contact. An MPOC model recognizes the need to have sufficient expertise at the point of support so that the customer can receive immediate support. This means that there will be several different support teams for solving different types of issues. It is a good practice to name one of these teams as the catch-all for obscure or misplaced problems. Support teams should be close to the service teams so that there is good feedback in both directions. Peer-to-peer support is also an important model. In this, the user community supports itself via social media. This is not new if you consider the break room as social media. The Service Desk should be active in this area, promote good support and watch out for harmful support suggestions. Esa Korvenmaa, Cisco Systems Finland Oy writes in his blog (Finnish) http://www.tietoviikko.fi/cio/blogit/ict_standard_forum/minun+koneeni+on+kauniimpi+kuin+sinun+tyonantajasi+kone/a779262 how Cisco Finland solved the BYOD (Bring Your Own Device) problem some years ago. IT gave up the fight and allowed Apple users to start using their own machines at work, but told them there will be no support. What happened was that the Apple community created their own social media support. End result was that satisfaction went up 200% and costs down by 25%. In the cases both Flowdock and Service-now have the whole company doing support. All except Enfo have customers providing part of the support through user forums. The main channels for contacting support are phone, email, messaging, social media, face-to-face meetings and ticket/forms. The number of channels is growing, which also increases complexity of support. Telephone is often the main channel, though its status has been diminishing. Telephone is a fast and interactive communication channel, which conveys emotions as well. A telephone conversation is always a moment of truth for the Service Desk. The key challenge in telephone service is having the right amount of staff available to answer the phones. People hate waiting in line; even a 30-second wait may be too much. The number of incoming calls varies a lot and is not random in the sense that it would be predictable. Many unplanned events cause correlated peaks in traffic, but between peaks it is quiet. A system failure will affect many people who will contact the service at the same time. It is difficult to keep up good service levels without having a large number of people waiting for phones to ring. A common solution is to have some staff doing back-office work, but available to jump in to answer the phones when needed. Personal phones are replacing the desktop phones and this can lead to problems as they pick up callers’ numbers. When customers learn a support member’s cellphone number, they can start contacting their favorite staff member, directly. Messaging is something between call and email. It is useful in many support situations, allowing the support staff to give detailed instruction to the customer. Tickets are a good way to the contact support if the system is well defined. The customers need to be encouraged to fill out their issue on a ticket form. The system should offer all kinds of immediate support, like password resets, system checks, automated orders etc. One way to increase use of tickets is by giving them preferred treatment. The tool should allow the customer to follow the status of the ticket and see what is happening. Email is less demanding for staff levels than phones, but it has its own drawbacks. Messages are often incomplete and interactions can take a long time. The data is unstructured and difficult to manage. Email processing can be automated so that it will be easier to handle the messages. Social media is the new break room. People meet and discuss all kinds of matters. IT problems will come up there, too. Peer-to-peer support will increase as social media makes it easier. The SD cannot control social media and must not even try to do it. Social media is an important channel to support and Service Desk 2.0 must be aware of the discussion. The SD should be visible in the social media. It should be supportive and positive, offer solutions and improvements, and not try to order or deny things. Social media in support can work at different levels. At one end, there can be a dedicated internal site just for support, with no other function. At the other end, there can be comments, questions and discussion at any open forum. With consumer services the latter will be inevitable, but with internal services the first option would be desirable. The problem is that it is hard to direct social media; it more or less just happens. Social media documents itself, it seems not a good practice to log all contacts as tickets. Old fashioned social connections, i.e. random meetings, are also an important channel that is hard to control. Some side flow is acceptable and useful, but one should keep the big picture in mind. It is ok to provide direct service as long as it does not risk the main goals. Service support needs a selection of roles and methods. The functions may be teams and/or roles. In many cases there will be a team that handles most of the work, but there will be also people who do not belong to the team, but step in to perform the function from time to time. For them, this is a role which they play when needed. All persons involved should use the common activity, method or process. Activity is a fairly simple task that people do. For example: setting up a user ID. Process is a structured collection of activities like providing tools and services for a new employee. Method is an approach to some tasks, for example solving problems or managing risks. It may contain some activities and processes but is not as predictable and controlled as a process. A support service function handles all incoming support needs. It monitors all channels and solves customer problems, registers feedback and handles orders. Monitoring and control function watches some service or services and tries to prevent any problems. Fault management function fixes faults. Risk management prevents future problems. This is most likely a role that many persons have. 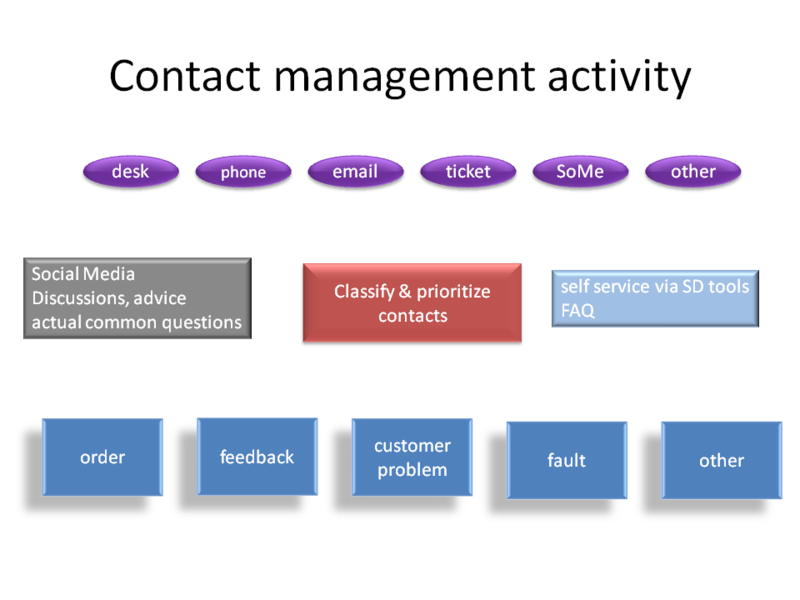 Contact management is a key process for handling all incoming customer communications. It has three subprocesses: order handling, customer problem solving and feedback management. Event management is the key activity of the monitoring and control function. It seeks to recognize potential faults and prevent these from affecting services. Fault management is the process for fixing faults. It gets its input from customer problem solving and event management. Adaptive case management is a method that the risk management team uses to prevent future problems. It can be also used for solving customer problems or faults. Risk management is a collection of methods and tools to analyse, control and prevent faults and problems. The true goal of Support is the success of the service. It should measure its activities but should not set any goals based on activities; goals must be based on outcomes. speed of answer and solution. There is no need to have more than 3-4 activity measurements. Fantastic. This makes a lot of sense. Somebody necessarily assist to make critically posts I’d state. This is the first time I frequented your web page and to this point? I surprised with the research you made to create this particular post extraordinary. Magnificent job!